Mint condition apart from the front/back covers that are a bit tatty. Cleveland, Ohio, 87. TJ Scaglione of New Jersey’s Whiplash filled in on drums for this show. Metal Church wrestle with half naked women in preparation for…the Metallica tour! w/ 4 photos! BABY TUCKOO: Force Majeure LP 1986 on Music for Nations with inner sleeve. 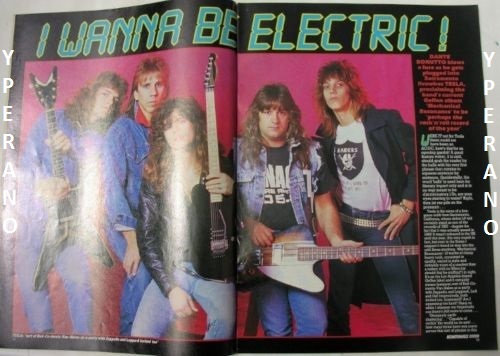 Hard Rock NWOBHM Geddes Axe gutarist, Accept singer. CHROME MOLLY: Take me, Im Yours 12″ One of Britains best-kept secrets. 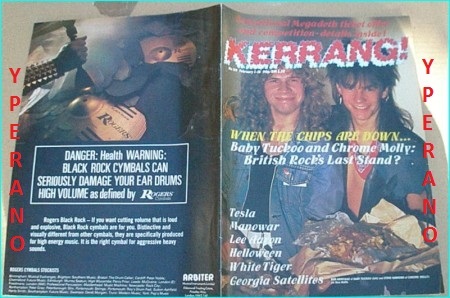 KERRANG No. 80 November 1984 Mint condition. Manowar on cover, Hanoi Rocks, UFO, Armored Saint, Thrash Metal. NIGHTSHADE: Dead of the night CD. Original, 1st press – MFN Records. Q5 members..
LIZZY BORDEN: Deal with the Devil CD Enhanced. used. + Alice Cooper & Blue Oyster Cult covers + Joey Vera.